3:05pm: All Interstates closed in Central OK.
3:24pm: Thundersnow and sleet is now over Coweta moving NW toward Tulsa metro. I have heavy sleet covering the ground white. The winds gusting to near 50+. H.E. Bailey Turnpike (I-44) closed from OKC to Wichita Falls. "Military being dispatched to rescue people stuck on road." 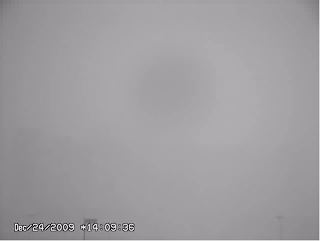 I-35 closed south of Norman, OK. Whiteout from weathercam at OU meteorology department. There are reports of one foot accumulations with 3' drifts in the OKC Metro Area. Report that all flights into OKC are cancelled. Confirmed, see below. Major delays at DFW International Airport, increasing in duration. There is one flight that is eight hours late! This is the 2:02pm AccuWeather winterized regional radar. The darker blue = heavier snow. Blizzard conditions are setting up in the Flint Hills of Kansas with winds gusts to 60 mph possible. Note the snow in the D-FW Metro area. Reports of heavy snow in Allen. The darkest blue = the heaviest snow. 2:20pm. Looks like the snow will intensify during the next 3-4 hours in far northern Oklahoma and throughout the Kansas Flint Hills region with very high winds. This is why this storm has been so difficult to forecast. This is narrow band of heavy snow (as these things go) and placing its exact location has been very difficult. OKLAHOMA CITY (AP) — The Oklahoma National Guard has been activated to rescue motorists stranded in southwestern Oklahoma made nearly impassable by a powerful winter storm. Oklahoma Turnpike Authority spokesman Jack Damrill says Oklahoma National Guard troops were asked Thursday to travel along the H.E. Bailey Turnpike to rescue motorists stranded by collisions or spinouts on the icy roadway. Damrill says Oklahoma Highway Patrol troopers have been ordered off the turnpike because of the dangerous conditions. Damrill says heavy snow and strong winds have reduced visibility to zero.